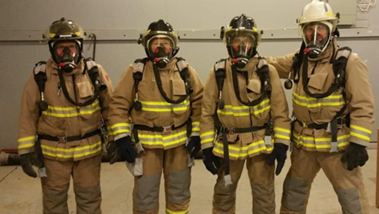 The Cartwright Volunteer Fire Department recently received a $20,500 IGA grant, making it possible for it to purchase self contained breathing apparatuses for its volunteer fire fighters. The breathing apparatuses will enable members of the department to serve the community in the event of a fire more safely, as it will allow them to breathe easier in smoke filled environments. The new sets came with new technology and have newly designed harnesses. The face pieces are more comfortable and the new regulator with HUD (Heads Up Display) for air capacity and low air alarms are ideal for low light environments, which will be a major assent in any fire emergency. 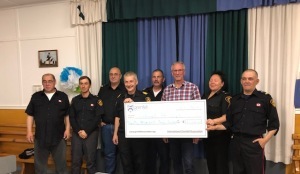 IGA Board Member, Rex Goudie was able to talk to the fire department, as well as present them with a cheque, at a recent dinner event, where they honored one of their own with a 20 years of service medal, as well as other presentations. The IGA is proud to support organizations such as the Cartwright Volunteer Fire Department, who work hard to make their community safe!